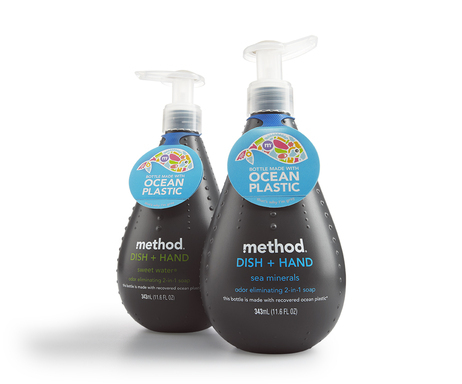 Eco-friendly home-cleaning products company Method has introduced a new dish and hand soap packaged in an opaque bottle made partly from plastic debris recovered from the ocean. The $4.99 limited edition bottles will be sold exclusively at Whole Foods and online. Over the past year and a half, Method employees have worked with local volunteers from Sustainable Coastlines Hawai’i and the Kokua Hawai’i Foundation to hand collect several tons of plastic from the beaches of Hawai’i, where the kinds of plastic needed to make this packaging are most abundant. A portion of the product’s proceeds will go to these two Hawaiian organizations as part of Method’s efforts to establish an ongoing business model and supply chain for collecting and sorting plastic marine debris. Hand-collecting washed up plastic debris is admittedly not an economically efficient way to create packaging for a brand like Method but certainly makes for a great story and consumer awareness campaign. The fact that Method employees were involved in the plastic recovery adds another dimension to that story and adds to the authenticity of the effort. The new product will be marketed to consumers via public relations efforts, product tags and social media. Our only beef? The vague “portion of proceeds” language used. What do you think of Method’s newest product? Weigh in below.